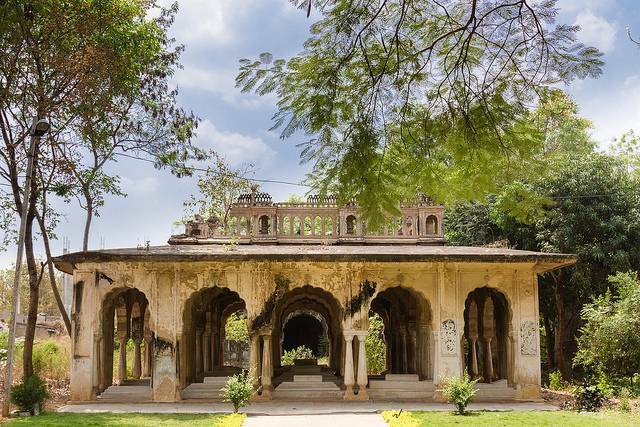 The Paigah Tombs were built by Nawab Tung Jung Bahadur of the Shums ul Umrahi aristocracy in 1787. The tombs have an impressive amalgamation of Persian, Mughal, Greek, Rajasthani and Deccan style of structural designs. The tombs are scattered across 30 acres of area and shelter the resting places of the entire Paigah family. The structures are completely enveloped with rich white marble give an insight about the power and wealthy status of the Paigah nobility. It is 10 kilometers far from the city of Hyderabad; so travelers can effortlessly pay a visit to this 18th Century architectural phenomenon. Paigah Tombs are an excellent specimen of architecture in the 18th century. If you are looking for a spot to visit in a short frame of time, Paigah tomb is the place for you- it takes only about 30 minutes to cover the place. The best time to visit will be during sunset where you can enjoy this place’s beauty away from the hassle of a town. A visit to tis spot will give you a very rich and fulfilling historical experience. As people start to get more and more interested in the concept of travelling, there are fewer spots left that not many people know of and is bereft of crowd. Paigah tombs are one such spot.